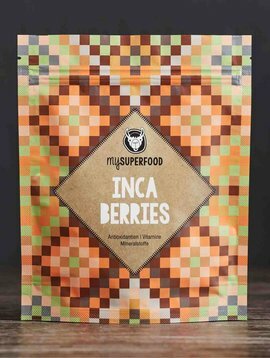 Our Superfood dried fruit is organically grown by our producer at an altitude of more than 2.500m near the ancient Inca capital of Cusco. They have a naturally healthy content of antioxidants, vitamins and minerals. Our berries are harvested by hand and afterwards processed very gently following the standards of raw food philosophy. They are 100% natural and organically grown. We buy our products directly from producers in Peru, with whom we have built a trustful partnership. Our superfood dried fruit is a tasty and healthy snack for in between. They are also highly suitable for use in muesly, cereals, desserts and many other dishes - some application examples can be found at our recipes or in our blog. For suggestions or questions we are available any time by mail or phone. We wish you lots of fun and healthy enjoyment with our products !